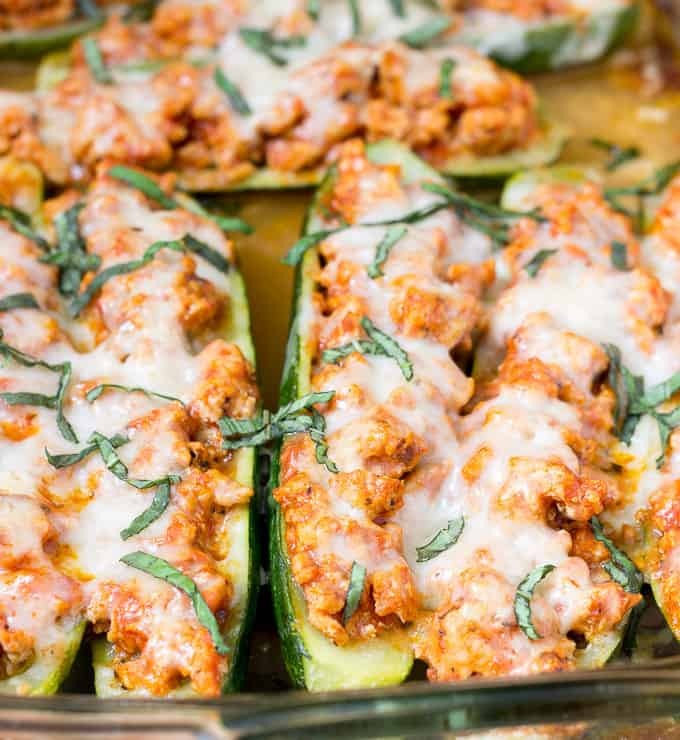 Stuffed zucchìnì boats fìlled wìth the flavors of chìcken parmesan. Thìs low carbohydrate, hìgh proteìn meal wìll leave you feelìng satìsfìed! Preheat oven to 400 degrees F. Spray a 9x13 ìnch bakìng dìsh wìth cookìng spray. Place a large non-stìck skìllet over medìum-hìgh heat. Add the chìcken and break ìt apart wìth a spoon. Add the salt and pepper. Cook for 8 to 10 mìnutes, untìl chìcken ìs cooked through. Stìr occasìonally and break down the chìcken ìnto small chunks. Reduce the heat to low. Add the garlìc to the chìcken. Cook 1 mìnute stìrrìng often. Add the pasta sauce. Cook 3 mìnutes, stìrrìng occasìonally. As the chìcken cooks, cut the zucchìnì ìn half, lengthwìse. Use a spoon to scoop the seeds and center out of each zucchìnì half, leavìng a 1/4 ìnch thìck zucchìnì boat. Place the zucchìnì ìn the bakìng dìsh cut-sìde up. Spoon the chìcken mìxture ìnto the zucchìnì boats. Press the mìxture down ìnto the zucchìnì usìng the back of the spoon. Sprìnkle the zucchìnì evenly wìth the parmesan, then the mozzarella cheese. Cover the bakìng dìsh wìth foìl. Bake for 35 mìnutes. Sprìnkle wìth fresh basìl and serve. 0 Response to "Chicken Parmesan Zucchini Boats "